← Summer is for Sadists. I used to use that as my tagline for a dating site I was on oh so long ago when I was first divorced. You’d be surprised how many men thought that was interesting enough to contact me. It was more than just a tagline, it was my life. About 11 years ago I started having problems sleeping. It was probably due to a lot stress. It lasted for about three months and eventually went away. Then about a year later it came back with a vengeance. This was during some of my prime of going to shows a lot with friends, and writing anything & everything I could. I pretty much stopped sleeping period. Maybe an hour or two a night. At least once a week I had about 5. This went on for well over 7 months. It was horrible. I was also going through a stressful time with a relationship I was in. And trying to raise a young child. It seemed the more I was writing the more I stopped sleeping. Granted back then a bit of a love for Bacardi & cigarettes at night really did not help matters. I stopped drinking the bacardi & diet cokes. The relationship ended. I stopped writing. Things calmed down and life picked up again. About a year later I was planning a wedding and the room in our new place, where we kept our computer, was a small, enclosed space. There were no windows. My writing became erratic and I became frustrated. Believe it or not the lacking of natural light was a big factor, I have this need to be able to look out a window when I’m writing. To watch the sky, the sun, the moon and whatever else is going on outside of there. A small, dark space just wasn’t working for me. I would try to work on projects that seemed to never take flight. Once again I was unable to sleep. Thankfully this lasted only a couple of months, and I was at least sleeping a few hours a night versus the one or two previously. That was the last time I had this problem. It was 8 years ago. However like the title suggests, the insomniac has risen. It started a little less than a month ago when we were on vacation in new hampshire. 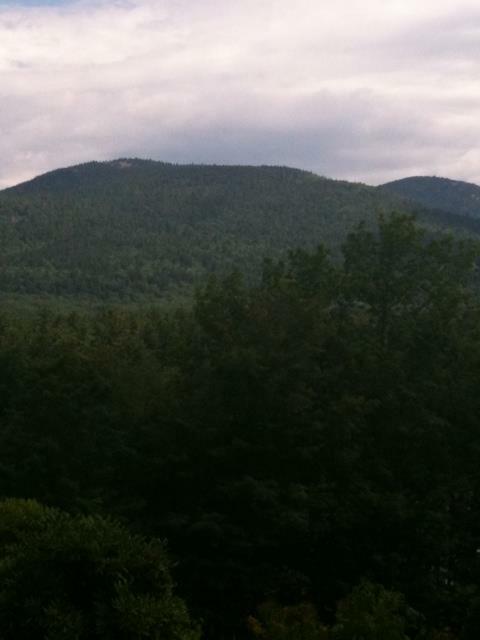 We were up in the mountains, which was beyond beautiful as an experience This is that mountain. It was what I saw from the porch every day. It made me happy. Now the problem began barely halfway through our week. I had no way to write up there. I don’t own a laptop, I hate typing on my cell phone to text so I sure as hell wasn’t going to try to post here through it. And I’ve become so accustomed to typing everything out, as my brain goes 100mph all the time so I have to, so when I would try to write things down by hand I’d forget half of it. So for a week I didn’t write. And I stopped sleeping. I would toss and turn until about 3 am. Then I’d fall asleep. And then by 7 am my youngest and her two cousins took to running the halls of the house we were in , laughing and screaming their heads off. I was a bit of a crab that week. When we got home I thought it would be better. But it wasn’t. I had a couple of days that I slept but not much. It didn’t help that we came home to the wretched heat and that made matters even worse because I felt like I was captive for most of the days with two kids who were bored silly. I at least utilized those late hours to write. I admit I do love being able to stay up late when everyone else has gone to bed. It was just me, my headphones and the computer. And usually an insanely large glass of wine to the left of me. Which was often refilled once or twice. I had several pieces going at once. I started posting them here on a rapid fire basis last week. But still, I wasn’t sleeping. Then there were two nights after I posted last week that I slept 9 freaking hours. And when I woke up in the morning I felt horrendous. Then I was back to 4 hours. The worst problem is that I’m a bit of a light sleeper so whenever J’s alarm went off each morning at 6 am I was up with him. I’m one of those people who cannot fall back asleep once they’re up. I would really like to stop being one of those people. I would say that the writing again, this opening of the dam if you must, has been a blessing and a curse. Over the weekend I stayed up to ungodly hours both nights. But at least I accomplished something each night. The following days however I was not fun to be around for my family. I have a tendency to withdraw when I’ve gone too long without sleep. I also have a tendency to talk too much. Which I know makes no sense, but trust me if you know me well it does. Last night I decided I was giving my liver a break and my mind a break and decided no wine, and no writing. That did not help at all. After dealing with a mind-blowing migraine all day yesterday that had me on the couch for most of it, I felt better that night and decided to put myself to bed at a decent time with a book. After all I was actually tired. It backfired. I tossed and turned until two. I did not however come down and write. I needed to give myself a break. Today I came close to passing out while walking down the halls of my son’s high school, and again a short time later in the car. The world just started spinning. My lack of sleep means I’m trying to overcompensate with the kids once I am awake, and today like a couple of others this week I forgot to eat. So here it’s almost 1 and I’ve been up since 6 with about 4-5 hrs of horrible sleep under my belt and I forgot to feed myself. This was not good. Luckily we made it home and once I ate I felt human again. It’s been raining here all day and that left all of us a bit under the weather. My daughter was content to draw all day and watch a movie. My son decided to come down with the worst cold ever two days before starting school. He sat on one end of the couch and I was on the other. He was watching tv. It was a bit after 3:30 when my daughter came in and woke me up. I fell asleep for a half hour on my end. I look over he’s asleep on his. The dog apparently decided at some point to join us in the middle. I did feel a bit better once I slept but the headache is returning and after getting advice from a couple of friends I’m fairly certain my inability to sleep properly is just that my mind has opened up. Everything that I once repressed, all my thoughts and ideas, are now waiting in line to get out. I’m guessing that if I take a night off of writing like I did last night, I’ll have worse nights sleeping then if I do actually write. So at least tonight, I wrote this. Without wine and at a very reasonable hour. I’m exhausted. And my kids go back to school the day after tomorrow. Wish me luck, I really need to get some sleep tonight in order to make it through this week. Because my late nights have to come to an end on the weekdays, which will be hard. My son has to be up at 5:30 am starting Wednesday, and I know this means I”m going to spend the first two weeks waking up when he does to get Mr.Crabby out the door on time.